This is College Physics Answers with Shaun Dychko. Change in internal energy is the heat added to the system minus the work done by the system. So heat is taken out and so we have negative 320 joules and then we subtract from that the work done by the system. 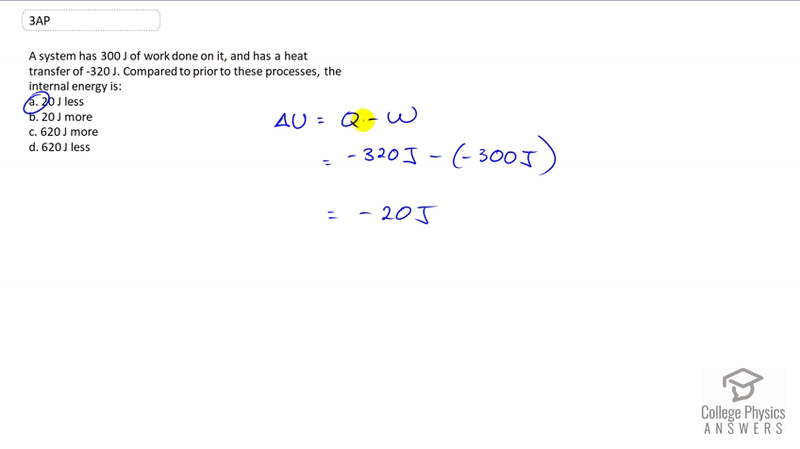 Now since this is work done on the system, the work done by it is the opposite so we have negative 300 joules substituted for the number or for the letter W. So we have negative 320 joules minus negative 300 and this makes a positive in which case we have negative 20 joules is the net change in internal energy and the negative sign means it's been reduced so we say, 20 joules less.